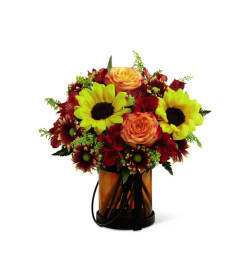 Featuring a rustic harvest styling that is on trend and ready to be admired, this gorgeous fall flower bouquet is brilliant and bright at every turn. 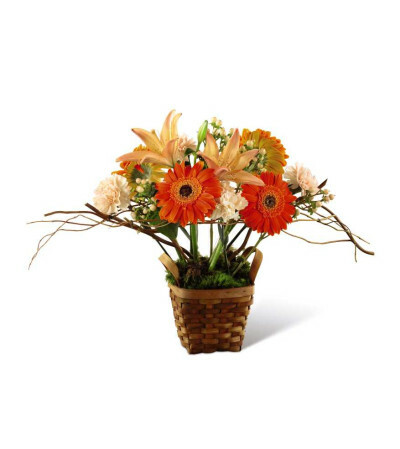 Orange gerbera daisies, orange Asiatic Lilies, and peach carnations are highlighted by peach hypericum berries, and curly willow tips, arranged to perfection in a dark stained woodchip basket with the look that they are sprouting from green moss found at the base of the display. 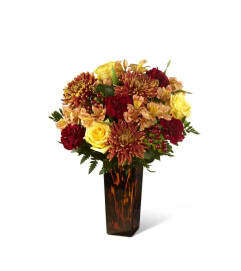 A great way to express love and gratitude to the special people in your life throughout the fall season.